Weak lower back due to underlying deficiency of kidney qi and yang. Chronic weak lower back, weakness and pain of the waist and knees and muscle stiffness are some of the imbalances satisfied clients have used this product for. 10 pills, 4 x day. 200 teapills per bottle. Schizandra chinensis fruit, Panax notoginseng root, Eucommia ulmoides bark, Cinnamomum cassia bark, Boswellia carterii resin, Taxillus chinensis stem & leaf, Panax ginseng root, Angelica pubescens root, Activated carbon, Botanical wax, Talcum. 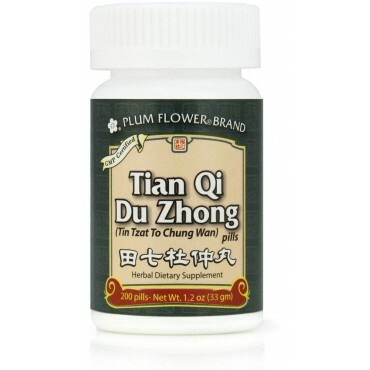 - Wu wei zi, Tian san qi, Du zhong, Rou gui, Ru xiang, Sang ji sheng, Ren shen, Du huo, Activated carbon, Botanical wax, Talcum. Contraindicated during pregnancy, or with hemorrhagic disorders.